There are 96 Assisted Living Facilities in the Pinellas Park area, with 7 in Pinellas Park and 89 nearby. The average cost of assisted living in Pinellas Park is $2,536 per month. This is lower than the national median of $3,346. Cheaper nearby regions include Saint Petersburg with an average starting cost of $2,442. To help you with your search, browse the 659 reviews below for assisted living facilities in Pinellas Park. On average, consumers rate assisted living in Pinellas Park 4.0 out of 5 stars. Better rated regions include Seminole with an average rating of 4.1 out of 5 stars. Caring.com has helped 20 families in Pinellas Park find high-quality senior care. To speak with one of our Family Advisors about assisted living options and costs in Pinellas Park, call (855) 863-8283. Pinellas Park, Florida is a few miles from Tampa Bay, Boca Ciega Bay, and the Gulf of Mexico, depending on the direction you are going. Equestrian events are popular in the city and fishing and water activities are available nearby. There are seven assisted living facilities within the Pinellas Park city limits and another 51 in neighboring cities like Largo, Seminole and St. Petersburg. Pinellas Park residents, like all Floridians, enjoy the state's lack of income tax, which includes retirement benefits like 401(k), Federal SSI benefits and pensions. There are also no estate or inheritance taxes in Florida. Pinellas County does charge a 7 percent sales tax on most purchases. In addition to lower taxes, the cost of living in Pinellas Park may also help seniors on a tight budget. The overall cost of living is 8 percent lower than the national average. Property crime in the area is somewhat problematic, although assisted living residents are generally unaffected. There are 4.05 incidents of violent crime per 1,000 residents per year, which is about average for the state and across the country. Pinellas Park boasts about 20 percent more sunny days than the average city, but there's also about 30 percent more rainfall. Summers are hot and humid with highs in the low 90s, and winters are short and mild with lows in the 50s. Pinellas County is a member of the AARP Network of Age-Friendly Communities, meaning its elected leadership "has made the commitment to actively work toward making their town, city or county a great place for people of all ages," according to AARP. The American Lung Association grades Pinellas County as an A for particle pollutants and a B for high-ozone days, which means that air quality shouldn't aggravate existing respiratory conditions. Assisted Living costs in Pinellas Park start around $2,536 per month on average, while the nationwide average cost of assisted living is $4,000 per month, according to the latest figures from Genworth’s Cost of Care Survey. It’s important to note that assisted living rates in Pinellas Park and the surrounding suburbs can vary widely based on factors such as location, the level of care needed, apartment size and the types of amenities offered at each community. 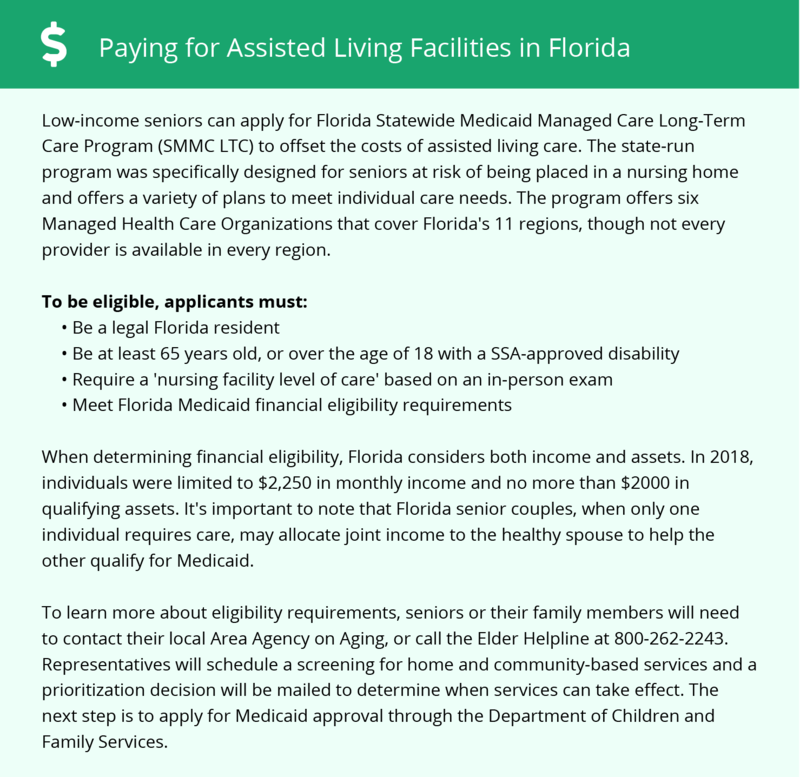 Seniors receiving Federal SSI benefits can apply for Florida's optional state supplementation to assist with long-term care costs. The state also has two programs, Medicaid Long-Term Care and Assistive Care Services, that can help low-income seniors with the cost of services at assisted living facilities. The plans don't cover room and board, but Florida does allow families to supplement those fees without impacting a senior's Medicaid eligibility or benefits. To see a list of free assisted living resources in Pinellas Park, please visit our Assisted Living in Florida page. Pinellas Park-area assisted living communities must adhere to the comprehensive set of state laws and regulations that all assisted living communities in Florida are required to follow. Visit our Assisted Living in Florida page for more information about these laws.